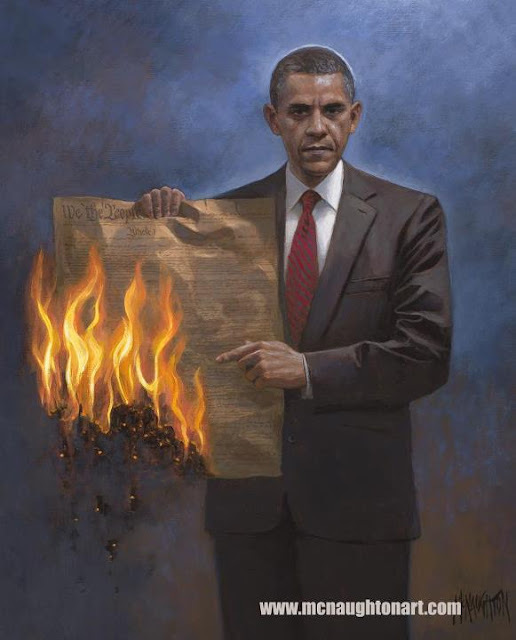 Conservative Hangout: Jon McNaughton Painting - "One Nation Under Socialism"
Jon McNaughton Painting - "One Nation Under Socialism"
Jon McNaughton, a painter that provides an accurate record of the current state of affairs in the United States of America, has released his latest painting that depicts President Obama holding a burning copy of the Constitution. In this painting President Obama is also pointing to the flames as recognition of what his past (and future?) actions have accomplished. You may know the artist, Jon McNaughton, from some of his past works which were deemed "controversial" by those that didn't like the brutal honesty with which they were confronted via Jon's paintings. I'll post pictures of two of his previous paintings below that you'll probably recognize. I want to state now that merely looking at the pictures below does NOT do them justice, nor does it do justice to Jon. One NEEDS to view all of Jon's paintings via his own website at www.McNaughtonArt.com to gain a more in-depth understanding of all the details in his paintings. Most, if not all, of Jon's paintings on his website are interactive. When you hover your mouse over each picture, every person, place, and a few items of clothing are described for you to the right of each picture. Please do not miss out on the interactive nature of his paintings on his own website. His website, in and of itself, is a work of art which is free to take-in. Don't rob yourself of the opportunity to experience it. 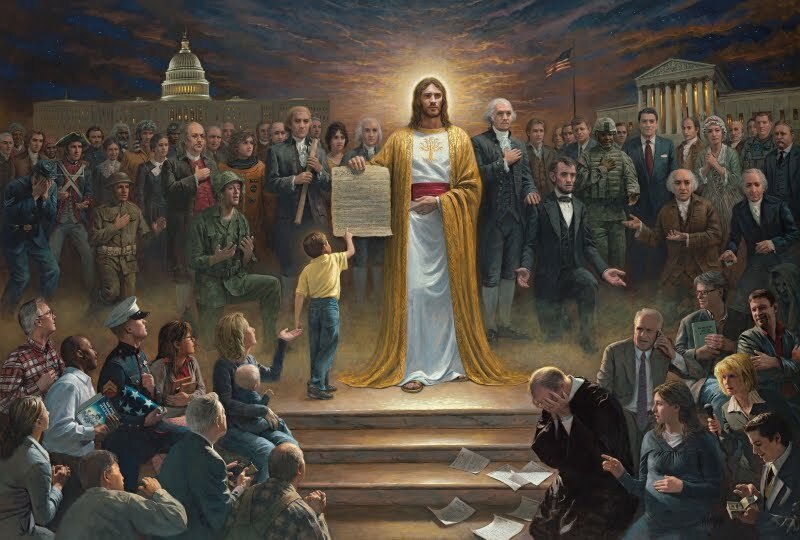 Perhaps the detail described on Jon's painting of "One Nation Under God" is the most descriptive - from the sash that Jesus is wearing to the individual "pieces of paper" lying on the steps in front of the Supreme Court Justice - it is an experience all should take-in. There are MANY details in these paintings that you should not miss. Just click on one of the paintings on his website to begin the interactive experience. Click the links underneath each of the two pictures below for the interactive experience on each of those paintings. With no liberty or justice for anyone." This November, you will make a choice. Will you choose One Nation Under Socialism? Why the title "One Nation Under Socialism?" What do you mean by an ideology, which can never stand? I will not support an ideology, which will lead to the destruction of America. In the history of the world, never has there been a recorded example where Socialism has led to the betterment of the human condition or improved the liberty of the people. I know there are varying degrees and definitions of "socialism." Even the European model of Democratic Socialism has proven to be a dismal failure. Do you want to see our country become like Greece, Italy, Portugal, or even Great Britain? What do you mean by "divisive, with no liberty or justice for anyone?" Socialism uses the illusion of offering fairness and justice for everyone by redistributing the wealth of the nation; picking and choosing winners and losers. This administration has taken over our health care system, given bailouts to the automotive industry, banking industry and energy industry. They support the "Occupy Wall Street" movement of increased taxing of the rich to pay for the welfare of the "less rich." The Constitution never guaranteed equal things—only equal rights and justice. In America we should be FREE TO SUCCEED and FREE TO FAIL! 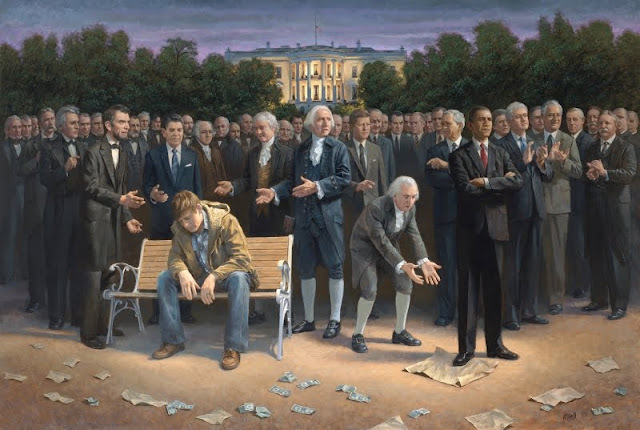 Below is his latest painting, "One Nation Under Socialism." Jon McNaughton's Facebook page - click HERE. Oh, and if you care to read just how the liberal media depicts Jon's latest work of art, you can read this piece...where, as of the time of this post, not many of the commenters seem to agree with the article. Good. Thanks be to you, Jon. Because the left owns the media in this country, I blog. If you don't share my posts, who else will see them?